Sometimes you see something on TV that makes you sort of do a bit of soul-searching, even when it was never intended to cause that bit of soul-searching. Or not. As I mention here upon occasion, I am well aware of my low-level, basic social dysfunction, but part of that awareness is also the awareness that there is absolutely nothing you can do about it. And so I was watching VH-1's Acceptable TV a while back, and saw this sketch. And as funny as I find it, when I mentioned to Jamie that maybe I identified a bit too much with Gar, she certainly didn't argue. So, as it turns out, I'm "Gar the Unbearable". Okay. I don't feel much like blogging for the next few days. Such is the fate of checking your Sitemeter statistics. 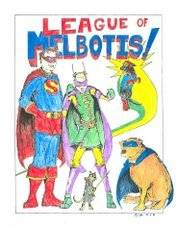 So I open the floor to you, the readership, to ask any and all questions of The League of Melbotis. I will answer them when I return. Also, this show will be on in the Fall. I think it looks pretty cool. I just saw 28 Weeks Later, and it got me thinking. There are many reasons I might make a good Zombie. 1) Team Player. Let's face it, one zombie on his or her own isn't usually that scary. That's why you have to work as a team. I'm no complainer, so I think that if all the other Zombies want to drift toward some boarded up house and I didn't want to, I'd probably still help the team terrorize the victims within just to let my fellow Zombies know I'm there for them at such a challenging time. 2) Not a picky eater. It's no secret that the Bros. Steans like their food, and part of that means enjoying trying new things. Most Zombies enjoy brains, but I'd be willing to try an ear or leg so everyone could have a shot at our victim. 3) Not a stickler for staying super clean. Part of being a Zombie is drooling your own blood down the front of your shirt, as well as getting splattered with the blood of your victims. This might bug some Zombies, but not me. 6) Can walk off injuries. Zombies are famous for wandering about with bits of their bodies missing, from limbs to eyes to gaping chest cavities. One nice thing about playing sports as a kid is that when the team needs you, you can sort of shake it off and keep moving. I think i can bring that to Team Zombie when someone puts a machete into my sternum. 7) Lots of mass, big guy. I'm a sizable fellow, and every crowd of Zombies needs a hulking Zombie that looks really menacing in the establishing shot. Sure, my natural good looks might keep me from appearing too menacing, but I'm sure after a few days of flesh sloughing off in sheets, I'd make a swell Zombie to really demand attention when our troupe first appears. 8) Well manicured teeth and strong jaws. Sure, I've had a few cavities here and there, and I suffer from a small under bite, but I think that when I'd go into a Blood Frenzy, other Zombies might really admire the way I can rend flesh and bone with my well cared for choppers and powerful jaw muscles. 9) Can take criticism. Everyone was new at being a Zombie at some point. And, heck, most Zombies that appear are only on the job a short while before they recruited you. But that doesn't mean that I can't hear what they have to say about my technique and form as a Zombie. No one is such a good Zombie that they can't learn a little from some constructive criticism. 10) Long term strategy. Look, you can go ahead and invade the shopping mall or try to overtake London, but what then? Zombies owe it to themselves to think long-term and really organize. Otherwise it becomes embarrassing after a while when you're just drifting around the streets saying "More brains..." when you know darn well there are no more brains. If the vampires know how to keep their food supply going, so should we. So with the 10 factors above, I think I could really make a bang-up Zombie. Also, I asked Jason tonight if he were armed only with an umbrella and had his choice of facing down a Zombie from 28 Weeks Later or a Gorn from the Star Trek episode "The Arena", which he might pick... Can you guess which creature he thought he could take? I dunno if this works. You can try linking here to subscribe. I gave my own Ma some props for Mother's Day, but I failed to give a shout out to Jamie's mom, Judy. Judy's had a rough Spring as she had a weird scare with what appeared on her CAT Scan as a sort of Brain Cloud. We were all pretty nervous as they had to perform some surgery on Judy's noodle in order to figure out what was going on. Well, the surgery went pretty well and Judy is recovering nicely. And now she has a metal plate in her skull and the ability to bend spoons with her mind. Judy has gone above and beyond in her mothering duties, and not just because she didn't run me off with a pitchfork (though I am sure she was and continues to be sorely tempted). Judy's always really helped us out with managing Jamie's complicated health paperwork, come up with creative ideas for our unique lifestyle situation and never hesitated to run to wherever we are when Jamie's been under the weather. We're glad Judy's recovering. We just hope she's following orders and not lifting anything heavier than one pound. So, today we salute you Judy! It's just really creepy now when you get mad and all the metal in the house starts flying out of the drawers and off the shelves. Happy late Mother's Day to all you Ladies of the League who have some kid depending on you for shelter and food. My mother is in Italy. Or headed there. Anyhow, I didn't get to see her today, but I did see her yesterday. We were both at the Astros/ Daimondbacks game, but we'd separately bought tickets, so we didn't sit together. It wasn't intentional. Jamie and I had decided to see a game or two this year, so I'd called up Josh some time back and we got some tickets. And not two days later my mom called and asked if we wanted to go with she and my dad to the game. Anyhow, this weekend we went to the 'Stros game and watched them defeat the Diamondbacks, which is okay. We sort of turned on the Diamondbacks last season and I sort of knew I would throw in with the Astros once we were in Texas. After all, We were going to be getting a lot more Astros games here, so it was sort of a practical thing. Plus, I don't care for Eric Byrnes. I don't know why, but the man bugs me. I was impressed with the Astros' new guy, Hunter Pence, which is a terrible name for a pretty good player. he had a good hit last night and caught one of Byrnes' flyballs this afternoon in that game (which I watched part of on TV). Anyhoo, it's baseball season, plus NBA playoffs, so I've been watching a lot of sports. Friday night we had dinner with Joanne P, in from Florida, and her lovely sister nancy, in from Michigan. They were here to surprise their mother for Mother's Day, which is pretty nice, I think. Nancy has a cottage in Lower Michigan if anyone is interested in renting a cottage for a week or so in the summer. It was great to see Joanne, who I hadn't seen in the flesh in five years or so. She looks eerily the same, even as I progress in my role as "the guy who is aging badly". Saturday we jumped in the car and left Wagner here to take care of the dogs (and see her brother and nephew) while we headed to Houston. We grabbed lunch then headed to the game where we caught up with Sarah H, as well as my folks. So I was all sqaured away with my new Astros cap and was ready to settle in for the game when I got a little too excited about the beer guy. I was seated fifth down the row and decided to expedite the transaction so I leaped over the empty row of chairs in front of us. I was mid-air when I heard a horrible shredding sound. My pants had split along the interior seam from the bottom of the shorts up to the crotchal region, thus exposing my red and blue striped boxer/briefs to the world. The annoying bit was that the shorts were literally brand new. I bought them last week as I own only two or three pair of shorts for some reason, but I also paused for a moment upon realizing what had happened to my pants to recall the scenario in which I'd purchased the shorts. "Oh, these are $8.00 less. I'll get these," I said to Jamie, a little too proud of the bargain I'd found. You get what you pay for, Leaguers. So, yeah, I wasn't so much standing up for the good plays, but I did spend a lot of time sitting with Jamie's sweater in my lap. Jamie's pink sweater. Anyway, I managed to make it from the top section of the stadium all the way to our car without getting arrested, nor anyone catching much of a flash of my translucent white thigh. Next time I will just pass the money to the beer guy like a normal person.